Happy Friday friends! This week has been a bit of a doozy (Vivi got another ear infection! ), but I am so glad it's Friday and that the weekend is upon us! We've got some fun weekend plans which includes a trip to DC (tomorrow, just me and Steve!) and celebrating my brother Tim's birthday at his and his fiance's new house (Sunday Funday!). Steve and I haven't been to DC just the two of us in a very long time and I cannot tell you how excited I am to have a lunch date at one of my favorite restaurants (Barcelona! ), and to do some shopping sans kiddos. I mean, a lunch date is pretty awesome but to get to shop in DC with my husband is quite phenomenal. Or I should probably clarify that it's more exploring and walking around than it is about shopping. I think Steve would rather stay at home with the kids than go shopping with me, haha. So yea, let's just say we are exploring and walking around and keep the shopping a secret from Steve. Earlier this week, we had some unusually warm weather, it was so warm that we took the girls out for dinner and ate outside! It was absolutely glorious to be able to do that in February. 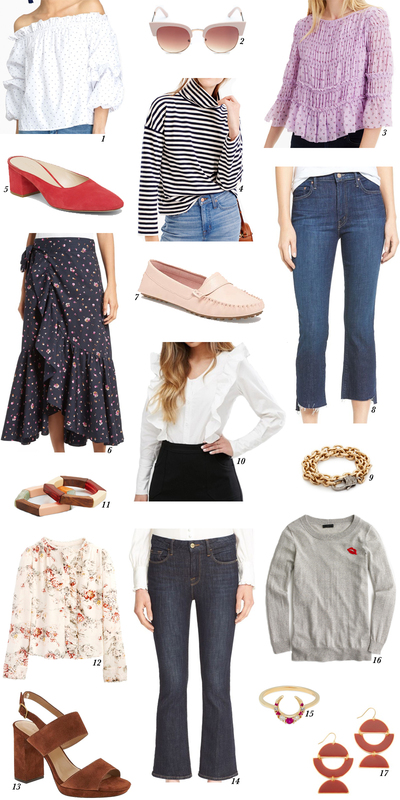 It was so nice to get a little taste of Spring and of warmer days ahead, which brings me to this wishlist. All of these pieces are great transitional pieces to take us from the tail end of Winter and into Spring. I'm especially loving that floral wrap skirt, would be so cute with just a plain white t-shirt knotted at the back. And I could see myself wearing those red mules all the time. And I just got those sunnies and cannot stop wearing them! They have this retro, movie star vibe that I love and instantly make any look I'm wearing chic.